Grand Forks ND may 17th 2013: In the Scott's Unlimited, Dynamic Drywall & Painting, CENEX, Best Friends Grooming & B & E Meats NLRA Late Model #7 Joey Pederson wins the 2013 season opener at The Legendary Bullring River Cities Speedway. Joey's new car was close to 3 miles per hour faster than the 2nd place car, it was really hooked up on The Legendary Bullring. 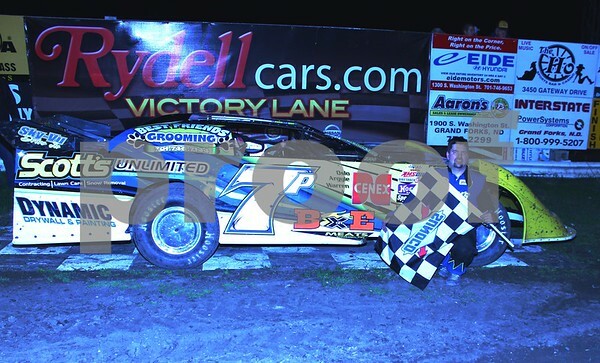 The fasted NLRA Late Model of the night and the 2013 River Cities Speedway season to date is non other than the season opener winner #7 Joey Pederson. Joey set the time to beat on lap 2 of the 2nd heat race for the Late Models at a lap time of 12.792 seconds and a top speed of 84.792 miles per hour. Track all the stats at River Cities new Results Page. Who will set the fastest times of the year? Joey set the bar in his all new Late Model. See you at next week's races and see who beats Joy's time and speed!